"Copper mining and ranching, they don't mix." Although the Gene Autry musical westerns were often churned out quickly and had a tendency to become formulaic sagebrush stories, every now and then one of the pictures would break out of the mold. 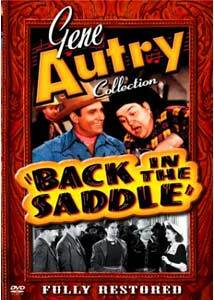 Such is the case with Back in the Saddle, appropriately enough since it's named after Autry's signature song. Perhaps that was considered appropriate for this story, which contains more depth and political intrigue than was the usual for the lengthy series. Gene (as himself), with sidekick Frog Millhouse (Smiley Burnette) have agreed to look after young Tom Bennett (Edward Norris), who is heir to a large Arizona ranch operation. But Tom oddly enough would rather be in the city, carousing and consorting with young women. Even when they get him back to the ranch, however, trouble's afoot, since the copper mine of E.G. Blaine (Arthur Loft) is pouring toxic waste into the river from which the local ranchers' cattle drink. Hundreds of dead stock lead to open warfare between the mining interests and the ranchers, but Blaine has the law in his iron grip and even Gene may not be able to save the day. While the conflict between the ranchers and the city folk isn't anything new in the Western, it's given a surprising intensity for the Code era. The fiery climax contains what surely must be one of the most vicious gunfights of Autry's entire film career; the streets are fairly littered with corpses by the finale. But the thoroughness of the rotten corruption of the town can hardly have any other conclusion; to have a peaceable resolution would have strained credibility far too much. Autry even gets some difficult moral decisions as he has to choose between Tom's life and the well-being of his fellow ranchers. The environmental theme and the relentless crushing of the population by the monied interests gives the film an important resonance even at a distance of sixty years. That's not to say it's a perfect film; there's the usual perfunctory romance with a girl singer, Taffy (Jacqueline Wells). Teen singer Mary Lee gets a bit too much screen attention and Smiley Burnette's comic relief is a bit too broad, with his Frog character being even more dunderheaded than usual. But Gene shines in the lead role, counseling for a reasonable resolution and frustrated with Tom's hotheadedness, and more two-fisted than usual when talking and the courts don't resolve matters. Also notable is Addison Richards as Duke Winston, an itinerant gambler who becomes an enforcer for Blaine, but also becomes something of a conscience figure for him, echoing Disney's then-recently-releasec Pinocchio. The songs are also better than usual, with a sizable number of bona fide country and western classics backing up the immortal title song. Special emphasis is given to Jimmie Rodgers, whose In the Jail House Now, When the Cactus is in Bloom and You Are My Sunshine are highlights in the score. Other tunes include Smiley's novelty song Ninety-Nine Bullfrogs, Lee belting out a spirited Swingin' Sam the Cowboy Man and Wells' warm rendition of Where the River Meets the Range. The great Johnny Mercer's satire I'm an Old Cowhand is given a somewhat awkward rendition in a duet between Autry and Lee, but it's still a fun song that warms the hearts of Skillet-Lickers everywhere. Image Transfer Review: The original full-frame picture is beautifully restored by the Gene Autry Foundation. The picture hardly has any defects beyond the occasional speckling. The picture's a shade soft at times, but frequently there's plenty of fine detail and excellent greyscale and black levels. Gene and Smiley's checkered shirts induce substantial moiré but otherwise the transfer is quite good. Audio Transfer Review: The 2.0 English mono track is acceptable for its age, with the expected hiss and slight crackle audible throughout. Bass is rather lacking but dialogue is crisp and clear throughout. The music sounds fine, though it naturally shades a bit more toward the treble register. Extras Review: The usual cornucopia of extras are here, including Autry's 1987 segments from Melody Ranch Theater and his radio program from March 30, 1941 (complete with period ads), when the film was just released. Smiley Burnette finally gets some attention in the extras section, with his bio and a selected filmography included (amazingly, he starred in over 170 films, so it's not complete). There's also a reproduction of a period Smiley Burnette paint book in .pdf form so you can print it off and paint it yourself! Copious still, lobby card and poster galleries are included, as well as both US and UK press kits. This is a fun and interesting set of extras that's even better than usual. A surprisingly tough-minded Autry outing, with a great set of songs, featuring a nice restoration and the usual ton of extras make this more than your usual Autry B-picture outing.